Welcome to the final day of The Escapist's Indie Developer Showcase, a 10-day celebration of the designers and programmers who have struck out on their own to make the games they want to make. Each day we'll feature a new game or demo by an up-and-coming indie developer along with a brief interview. Some games are already commercially available, some are works in progress, but all are free to play. To check out what you've missed, click here. Enjoy! Chris Delay is the Creative Director at Introversion Software, a U.K.-based independent game studio who has released a number of classic games in their eight years of operation. We spoke with him about Introversion's most recent title, Multiwinia, and what it's like to develop games in a small shop. "My background is in software engineering which I studied at Imperial College, London. I'd had some jobs within the games industry but was pretty disillusioned with the direction the industry was taking, the countless sequel cash-ins and monopoly of the publishers was stifling any creativity left. I'd been working on some game ideas during uni and approached some mates to see if they'd be interested in helping me sell them. To my surprise they were and Introversion was founded - that was all the way back in 2001! To date we've released four games: Uplink, Darwinia, DEFCON and Multiwinia, and we're currently working on our first console release with Darwinia+, a package containing Darwinia and Multiwinia that will be out on XBLA this summer." 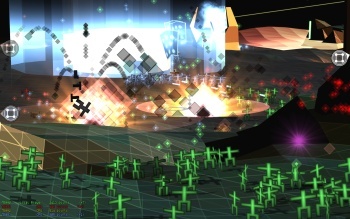 "Not many people know this, but Multiwinia is the game that we had originally intended Darwinia to be. Inspired originally by the Indie Game Jam, the idea was to pitch huge armies of sprites against each other in massive chaotic wars. During the development of Darwinia we struggled to find a way to make this work whilst still being fun, and we decided to concentrate on the single-player campaign side of the game instead. Darwinia won awards at IGF, and as a consequence of that we were approached by Microsoft to put Darwinia on XBLA - the only drawback being they needed a multiplayer component to the game. So we decided to revisit some of our original ideas, and slowly Multiwinia was born. We liked it so much we decided to release it as a stand-alone game on the PC. I know I'm biased, but Multiwinia really is a hell of a lot of fun to play - we learnt a lot from MS about usability in games and I think we really nailed it this time around. Multiwinia is definitely our most accessible and fun game to date. Imagine a beautiful fractal vista, tribes of warring sprites and a whole heap of crazy weapons and power-ups, and you've got Multiwinia." What's the most difficult aspect of working at an independent studio? "It can be frustrating because we are often short on cash and resources - we make most of our cash immediately after a game's launch, then we gradually spend that cash over the long periods of time between games. So when we project ahead, we are often very low on cash close to the next game release - there is no spare, and everyone on the team is fully allocated and busy. So it makes it very difficult to take up opportunities or do jobs that we really want to do. Sometimes we end up doing things a harder/longer way in an attempt to save cash. It can be tedious because often you know exactly what you should do, but you can't due to a financial or resource shortage."